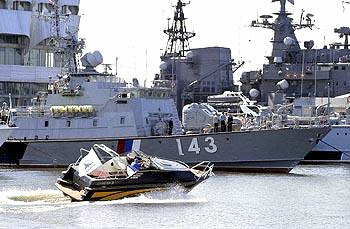 Over 400 Russian and foreign firms and organizations have filed applications for taking part in the Second International Naval Show, due to be held in St.Petersburg on June 29 through July 5, 2005. Deputy head of the Federal Industrial Agency Armen Dzhalalyan said at the presentation on Thursday. "The participants' interests range from research, designing, production and servicing of weapons and military equipment, work and services for the armed forces and the defense industry, to work in the field of novel materials and information technologies", he said. The presentation was held for representatives of the military diplomatic missions accredited in Russia. Also speaking before diplomats from 25 countries were deputy industrial and energy minister Andrei Reus, Rosoboronexport deputy general director Vladimir Pakhomov, vice-governor of St.Petersburg Mikhail Oseevski. Deputy commander-in-chief of the Navy Mikhail Zakharenko said that the importance of the Naval Show is growing because "serious changes have taken place in the pattern of export of military equipment: over 50 percent is now naval equipment, pushing aviation to the second place". Recalling that the 50th anniversary of military-technical cooperation between Russia and foreign partners was recently marked in Russia, Mr. Zakharenko stressed that over this time Russia has sold and shipped to foreign countries over 2,000 surface ships of different types, submarines and speed boats. Out of the expected volume of export of approximately 5 billion dollars in 2005, 50 percent will fall on naval equipment, he said. Those present at the presentation hoped that many fruitful meetings will be held and new contracts singed in St.Petersburg. Representatives of the organizing committee of the Naval Show said that over 80 percent of the exhibition floor space has been booked. The Second International Naval Show is held in accordance with the instruction of the Russian government. The organizing committee chairman is Russian Industrial and Energy Minister Victor Khristenko. Among the organizers are -- the Federal Industrial Agency with the Defense Ministry participation, Rosoboronexport, the government of St.Petersburg. Events archive for 29 June' 2005. Events archive for June' 2005. Events archive for 2005 year.